Rookie running back Eddie Lacy is third in the NFL in rushing touchdowns with 10, eighth in rushing yards with 1,112 and fifth in rushing attempts with 263. GREEN BAY, Wis. — Eddie Lacy wants to be named the NFL’s rookie of the year. The understated Green Bay Packers running back isn’t hiding his desire to be recognized for his first-year production. "I would love to win it," Lacy said. "I think it would be a huge accomplishment." Lacy has only one player competing with him in the race for the award: San Diego Chargers wide receiver Keenan Allen. Comparing the statistics of Lacy and Allen through Week 15, though, and it appears that the Packers’ workhorse runner will get his wish. Lacy is ranked in the top 10 in the NFL in every major statistical category for running backs. He’s third in rushing touchdowns with 10, eighth in rushing yards with 1,112 and fifth in rushing attempts with 263. Lacy has also added 33 catches for 242 yards out of the backfield. Of his 296 times touching the ball, Lacy has fumbled just once. Allen isn’t ranked any better than 16th in the NFL among wide receivers. He’s 36th in the league with 66 catches, ranked 23rd with 957 receiving yards and is 16th with eight touchdowns. Of the 66 times he’s had the ball in his hands, Allen has fumbled twice. 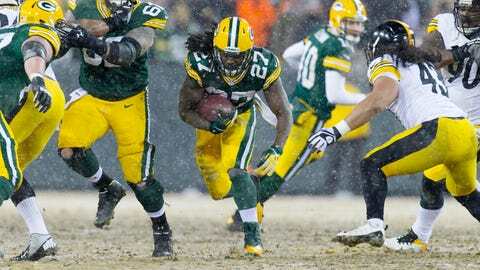 "Honestly, I don’t know too much about it," Lacy said of his chances to win the award. "I know (that I’m) what, one of three? That’s pretty much all I know. I don’t know, man. If I can win it, I’ll be very happy with that." Allen has been one of the Chargers’ top two receivers this season, splitting team honors with tight end Antonio Gates as to which of them leads certain statistical categories. Working in Allen’s favor is that he got hot late in the season, scoring five touchdowns in the past three games. Lacy has made such a big difference in Green Bay’s offense. Last season, the Packers’ leading rusher, Alex Green, had only 464 yards. Green Bay hadn’t had a 1,000-yard rusher since Ryan Grant in 2009. Lacy has surpassed that mark, becoming the franchise’s all-time leading rookie rusher in the process. "I think he should be a rookie of the year candidate," quarterback Aaron Rodgers said of Lacy. "He’s been so consistent for us. First 1,000-yard rusher since RG (Grant) did it a couple years in a row. He’s a talented back." Lacy’s bruising running style has translated very well from his college days at Alabama into the NFL. He’s broken 55 tackles this season, according to ProFootballFocus, which is the third-most in the NFL among running backs. Seattle’s Marshawn Lynch leads that category with 68 broken tackles. "(Lacy) reminds me of Marshawn," Rodgers said. "I got to play with Marshawn in college (at California), which I think is a great compliment to Eddie, because the first guy rarely ever brings him down. He has very good speed for a guy of his size. He catches the ball well out of the backfield, he’s smart, he cares about it. I think he’s had a great season for us." For all the concerns coming into the draft about Lacy’s ability to stay healthy — a concern that dropped him down to Green Bay at the 61st pick, the only injury that forced him to miss a start was a Week 2 concussion. Lacy suffered a sprained right ankle in Week 14, but he came out the next week in Dallas and played so well (20 carries for 141 yards with one touchdown) that he was named the NFC’s offensive player of the week. "I was really proud of him to tough it out (against the Cowboys)," running backs coach Alex Van Pelt said. "That ankle was big and swollen. He did have a bad sprain. Never complained about once. He actually aggravated it in the game. Took a couple plays off and came back in and was able to do what he did. "That’s a tribute to him, his toughness and his mindset. He knows how important he is right now to this offense and he’s not going to let his guys down. He’s going to do everything he can not to just go out and play a little bit dinged up but to play exceptionally well dinged up is a tribute to him and I’m proud to coach him." If Lacy wins the rookie of the year award, he likely won’t take the stage at the NFL Honors show and talk for too long. But with the way his production compares to Allen’s and the rest of the NFL’s offensive rookies, Lacy might want to begin writing his acceptance speech now. "He’s a mild-mannered guy, doesn’t talk much about it," Van Pelt said. "He just goes out there and does it. He gets into a different mindset and focus on game day where he locks in and it’s been great to see, especially with a young player."